The DSC Impassa 9057 is a robust wireless home security system and is one of the finest self contained cellular alarm systems available today. If you do not have home phone service... no problem. The DSC Impassa 9057 has a built in cellular communicator and communicates directly to ADT Central Station Network without using a traditional phone line. With cellular alarm communication being the DSC Imassa 9057's primary means of communication, you also do not need to worry about a burglar cutting your phoneline like you do with traditional security systems. A cellular alarm system also connects in approximately 6 seconds to ADT's Central Station Network, four times faster than dial up with traditional phone line home security systems. In home emergency situations seconds save lives. With the DSC Impassa 9057 you will enjoy the benefits of ADT SecurityLink Two-Way Voice Monitoring without home phone service. Until recently Two-Way Voice Alarm Verification with ADT was only available with dial up phone line communication. There were ADT monitored home alarm systems that used phone line communication for Two-Way Voice communication and had cellular backup protection in case a burglar cut the phone line. However, the Two-Way Voice communication did not work over the cellular backup unit. Now you will have ADT SecurityLink's Voice Connect communication over cellular with the DSC Impassa 9057. With this cellular alarm system you will still have Two-Way Voice's audio alarm verification, higher priority police response, ADT Operator's voice challenge of burglars, false alarm reduction and personal emergency communication in police, medical and home fire emergencies. One of the concerns some customers have with wireless self contained security panels is having a burglar tear the security system from the wall. With the traditional phone line communication of most self contained security panels, if a burglar were to pull the security system off the wall the unit would not communicate to the Central Station. However, with the DSC Impassa 9057's internal cellular communication and battery backup it can still communicate to the ADT Central Station Network even if it is torn from the wall. It also has a tamper switch on the back of the unit that immediately sends an alarm signal if the unit is even slightly pulled away from the wall. The DSC Impassa 9057 uses ADT Monitored wireless door/window sensors, wireless motion detectors, wireless key chain remotes, wireless glass break detectors and wireless smoke/heat detectors. This cellular home security system also has the option for a wireless secondary keypad, wireless outdoor siren/strobe, wireless indoor siren and a wireless carbon monoxide detector. DSC Impassa 9057 has a digital clock and can also show the outdoor temperture when installed with the outdoor siren. 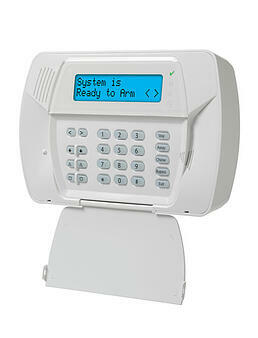 To order your cellular alarm system for installation call 1-800-310-9490.